Volvo 66 saloon. Based on the DAF 66 but with bigger bumpers, a diiferent more conventional gear selector and other detail changes. This is a DL model. It is quite well known and documented that DAF was basically a family firm - the van Doornes - and, whilst becoming ever more successul in the design, building and selling of its cars, it faced an uphill struggle to compete with large car makers. During the late 1960s and early 1970s, the company toyed with the idea of working with other manufacturers, including the likes of Audi and BMW. And of course, it had a business partnership with Renault, who supplied the water-cooled engines for the DAF 55 and 66. But with ever increasing competition, it was getting harder to go it alone. The Swedish company, Volvo, had also been looking to partner with another manufacturer, especially with the looming energy and oil crisis. Volvo only had their 140/240 large car range, and time was running short to consider designing a smaller car. 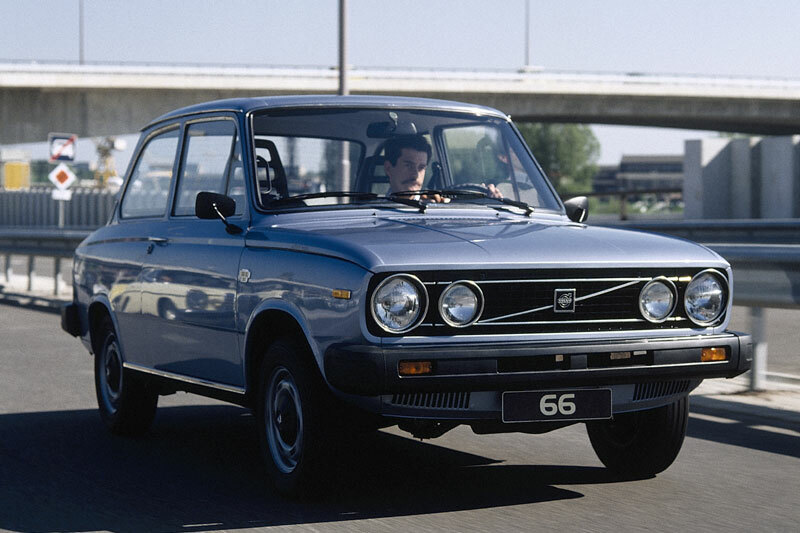 Volvo soon launched the 66 in 1975 which was basically a DAF 66 but with minor mechanical and trim changes. The most obvious was the fitting of large rubber bumpers and the use of DAF Marathon high-backed front seats, and the fitting of rear seat belts. The car was still only ever made with the Variomatic transmission, but Volvo changed the gear selector lever to be "more conventional". I.e. using the "PRND" that would be familiar to drivers of other automatic cars. It was available in the saloon and estate body designs. Sadly, they chose not to use the shapely coupé body. The Volvo 66 was a very refined and comfortable small car and continued in production as late as 1980. They are also now very rare and DAF enthusiasts are very keen to find and preserve these cars too. The Volvo 343 started out life in 1969 as a completely in-house design by DAF. The "Project P900" was intended to come to market as a larger DAF. Unlike the "B-body" cars, DAF decided to design the body as well as the engineering aspects of the car. It would have been very futuristic and forward thinking for the time, because it was a 3-door hatchback. Although this is a standard type of car now, in the late 1960s, it was a very innovative idea. But, history was to see Volvo taking DAF over and therefore onward development of this car. It was launched in 1976 as a three-door hatchback and only with Variomatic transmission. Hindsight suggests that they were a little early with the launch - very early models seemed to have quality control problems. Soon, to meet customer and market needs, Volvo launched manual gearbox versions of the car along with five-door versions too. They even introduced powerful 360 models which used the 2-litre Volvo engines with manual gearboxes. Quality improved over the years, and model upgrades saw the name being changed to Volvo 340. It carried on in production right up to 1992, and the last one to come off the production line was a Variomatic version.